07 Feb St. John Shade Project umbrellas soon to be at Skinny Legs! Skinny Legs’s owner Doug Bean talks about St. John and Shade with ShadeScapes CEO Jo Edmondson. Everyone who has been to St. John knows and loves Skinny Legs! We are excited to bring some extra shade to this iconic, community-oriented Coral Bay location. I love thinking about the past and future of this family-friendly, affordable bar and grille. 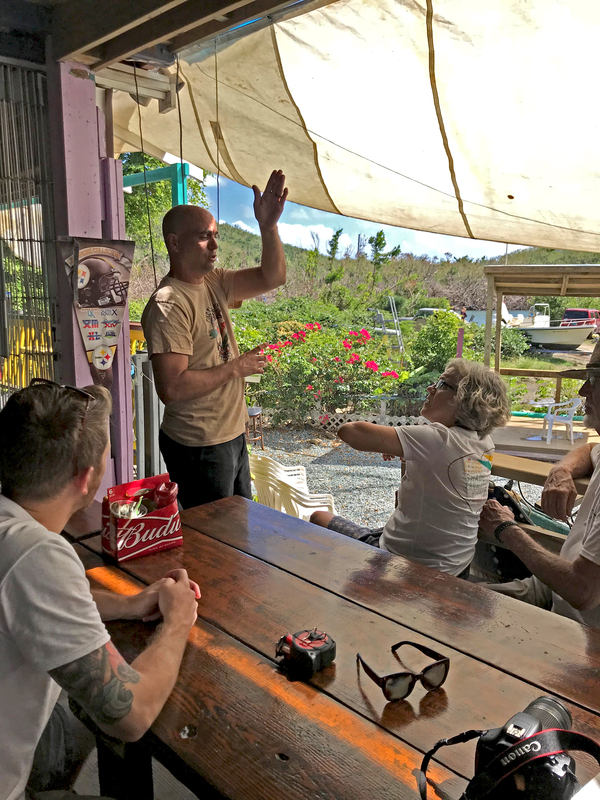 Skinny’s backs up to beautiful Coral Bay on the eastern side of St. John, and is known for their incredible, hand-patted char-grilled burgers, colorful decor, and casual backyard seating. Heading down to Skinny’s is a ritual for so many of us, and now my team can’t wait to join in on the fun during the St. John Shade Project week. Doug Bean and Jaime Elliott became the owners of Skinny Legs six years ago, but the restaurant has been a part of their lives since Doug started there as a prep cook in 2000. Skinny Legs has always operated as a family and the restaurant’s manager, Jordan, and head cook, Phillip, have worked tirelessly alongside the owners to re-open. The restaurant sustained extensive hurricane damage to the roof, storage areas, dining room, and kitchen. Even though everyone was living in homes without power, the team forged on without complaint and was able to re-open the restaurant on December 17. The “backyard” is a wonderful spot to relax in the shade from the hot Caribbean sun (and occasional rain showers) to catch great music and have fun conversations with staff and other diners who are guaranteed to love Skinny’s as much as you do. St. John Shade Project concrete crew relaxes at Skinny’s after a day of getting bases set for two new umbrellas. As for older memories of Skinny’s (which I imagine lots of you have! ), mine go back to when it was Redbeard’s in the early 80’s, owned by Ted Johnson. The next owners of the property, Dougie and Moe, opened Skinny Legs. I knew Dougie prior to Skinny’s when he was the famous, friendly, and funny bartender at the Back Yard Bar in downtown Cruz Bay. If you’ve never seen this story from the book Seadogs, Clowns & Gypsies, it’s a must-read about the days Dougie was at Back Yard. There was never a visit to Skinny Legs’s where Dougie didn’t come by, give me a hug and say “welcome home.” Years later he’d say hello to my kids, who loved to run around Skinny’s backyard and deck. It was so wonderful to meet the current owners, Doug and Jaime, on my trip in December. Our St. John Shade Project team is excited to bring some large, beautiful shade umbrellas to Skinny’s deck and backyard in February! And we can’t wait to have one of those great burgers. Share your stories, new and old, about Skinny’s–we’d love to hear them, and we bet the rest of you reading this would love to as well! 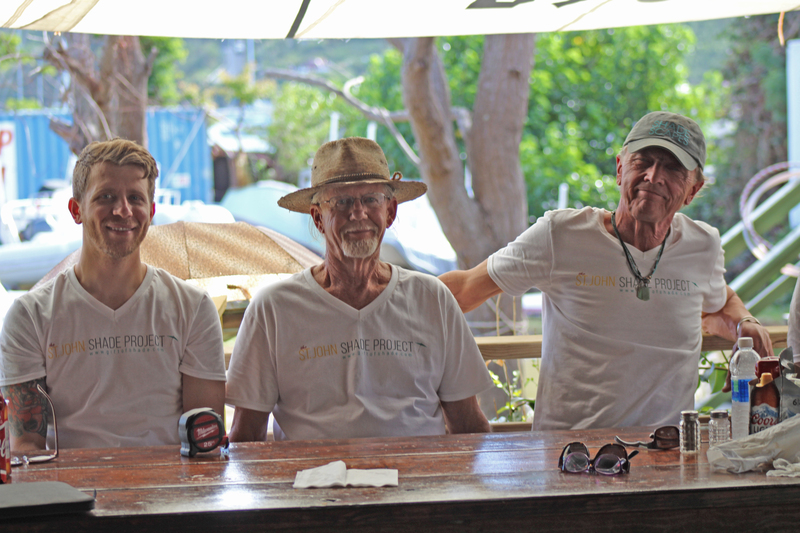 Support the ongoing efforts of the St. John Shade Project by shopping our Gift of Shade Outlet.